I’m super excited to introduce Timeline Organizing Consultants’ first Featured Business profile….John Pedigo and his homegrown business, Littleweird. John is a San Francisco artist with a Haight Street address (how’s that for urban art cred?) 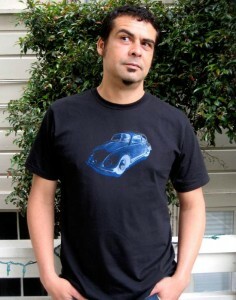 He produces and sells screen printed t shirts featuring his original art. He has a shop on etsy.com, http://www.etsy.com/shop/Littleweird, where you’ll find tees for men, women, and onesies for the kiddos. Fond of classic cars? You may as well stop reading now and click on his site—you’re going to love what you find. Full-time parenting is a wonderful job. But exhausting. Nevertheless, John worked up some entrepreneurial mojo and decided. He made the commitment to start Littleweird, and it’s been full steam ahead ever since. Q. What was the inspiration for starting Little Weird? Why now? Q. As a home based business, where do you print your shirts? Q. As both an artist and dad to a busy toddler, how do you manage your creativity? Do you set regular hours, or work when inspiration strikes? Q. What’s been your greatest challenge as a start up business? Q. What, so far, has been most rewarding? A. Getting feedback from customers who love and buy your work. A great day selling shirts comes in a really close second.